Zorkos Beach lies in the northeastern part of the island. It is a lovely beach with a beautiful golden sandy shore. The waters are crystal clear and transparent. Where the sand stops, the vegetation which is the decoration of an unusual landscape, with mountains embracing it, and plants fill the atmosphere with fragrance. The silence of the place is shocking. There are moments, especially in the afternoon when people slowly move away, you can hear only the waves sound. Zorkos beach has managed to keep intact its precious and valuable silence. It is vast, so it offers plenty of space for everyone. It does not suffocate; it never seems very full. You can feel alone if you want, although there are others near you and at the same time, there is always room for another visitor. 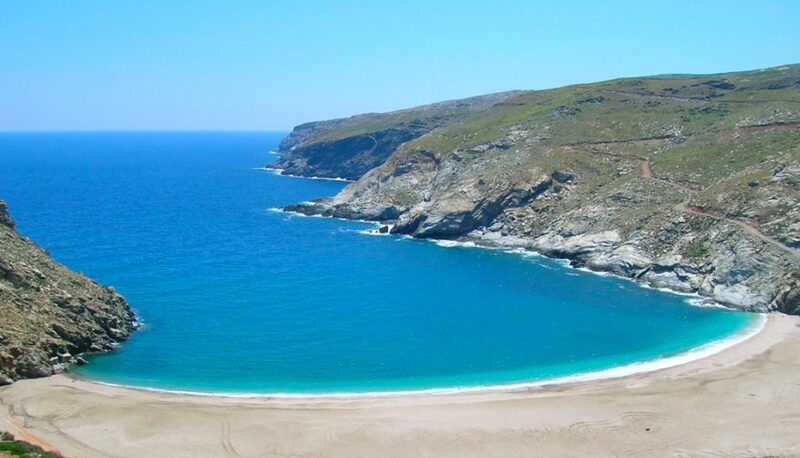 Zorkos beach is gorgeous but also relatively exposed to the wind, so you have to plan your visit wisely. The rocks that offer protection from the sun are few, so you must wake up early. Otherwise, you have to be prepared. Zorkos Beach is located above Gavrio and shortly after the Varidi village. It is effortless to access it via an asphalt road for the most part. The view along the way is magnificent. The sea, at whatever point you look at it, is beautiful.